Escape from it all our luxury Hot Springs, Arkansas bed and breakfast! 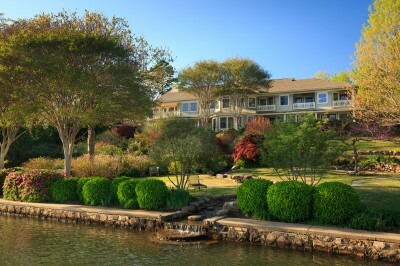 Our stunning lakeside property offers 12 rooms and suites with King or Queen beds featuring breathtaking views of Lake Hamilton and our gardens. Families and small groups will enjoy our separate two bedroom Hot Springs Condo, Lakeview Terrace, for additional space and privacy. Indulge each morning in a gourmet breakfast, either in bed, at your private table in our dining room or on the patio by the waterfalls. Spend your days exploring Hot Springs, napping in a hammock or take the canoe out for a spin around the lake. And be sure not to miss our afternoon reception, with dessert, appetizers, wine and tea. Your stay at Lookout Point Lakeside Inn will leave you feeling pampered and refreshed! We also offer pet friendly rooms and we are the perfect location for intimate Arkansas weddings!